You won't find peanuts like these in your local grocery store. Grown, picked and roasted by a small family business, the nuts that make it into our jars are only the largest 2% of the crop. They're called "supers" - and that's just what they are. Watch out: once the lid is off, they won't last long - at least they don't around here. Amazing flavor and crunch comes from a special roasting process called "blister frying"
These are absolutely the best peanuts I have ever tasted. 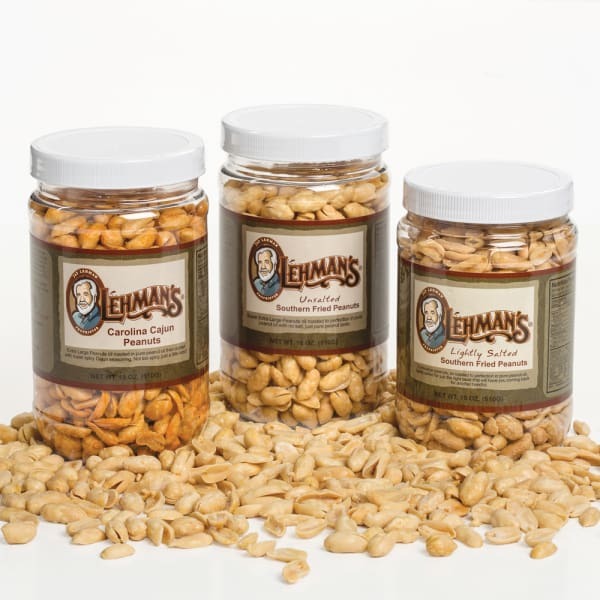 We buy them for family gifts as well as for ourselves and have bought the peanuts regularly since first discovering them several years ago. It's hard to stop eating them once the jar is open. I especially appreciate that the Cajun seasoned peanuts are not too salty. Best. Peanuts. Ever. I've never had peanuts anywhere else that were as good as these. And the sodium is at a reasonable level, so I can still enjoy them even though I'm sticking to a lower sodium diet. The cajun peanuts made the best Chex party mix this Christmas! I made the traditional recipe, but used a whole jar of cajun peanuts instead of plain, plus I dumped all the loose seasoning powder in the bottom of the jar all over my party mix and stirred it all together. Spicy and yummy! These are by far the best peanuts that I have ever tasted. They are so good that I can't stop eating them. Even though I eat a lot of them, they do not cause any digestive problems. I am on my third bottle now and will continue to buy them. These are fine blister-fried peanuts, and the cheapest on the internet. My only complaint (and reason for the lost star) would be the consistency of the roasting time. The first batch I ordered were all roasted to a beautiful golden brown, full of peanut flavor. The second batch was much less flavorful and then I realized that the jar was a mix of brown and pale peanuts, and indeed the darker peanuts were significantly more flavorful. So while I would prefer all the peanuts to be roasted longer, I also use the peanuts as dog-training treats, and the dogs perform just as well for the paler peanuts and I get to enjoy the darker ones. I took a jar of the cajun peanuts to a gathering over the weekend and they were GONE before you could say Jack Robinson. People loved them. They're super crunchy and the cajun seasoning is just-right spicy. Will buy these again! Without a doubt, the best peanuts I have ever tasted. They are so big, so crisp, and so crunchy that there really isn't anything else quite like them. I'm a repeat customer and I expect to keep buying them from Lehman's.